Broccoli and cauliflower mingle with tender chicken in a flavorful broth. Place vegetables in a large stockpot. Top with chicken. Pour water and chicken stock into the pot. Add salt, pepper, and thyme. Bring to a boil and simmer until chicken is fully cooked and vegetables are tender, about 20 to 30 minutes. Remove chicken from pot and let cool. 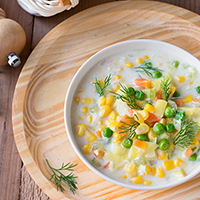 Using an immersion blender or potato masher, coarsely mash most of the vegetables. (You want a somewhat creamy consistency, but still keep some bigger chunks of vegetables.) Stir in the milk. In a small bowl, whisk the flour in 2 Tbs water until fully dissolved. Bring the soup to a boil and slowly pour in the flour mixture, stirring constantly. Let soup boil until thickened, about 5 minutes. Dice or shred chicken and add back to the pot. Stir until heated through. Re-season with salt, pepper, and thyme to taste, if desired.